It's finally here. I felt like I needed just one more flower. Just one more. I didn't get the inspiration until yesterday. Surrender is the word that sparked the thought of the last flower design (the red and white one). I was in the car listening to an interview with Shriley McClaine. At one point of the interview she said that one of the biggest lessons she's learned in life, is to surrender. It took me a moment to ponder that and then boom... the flower came to mind. I have no idea why. About 60 seconds later the design was complete in my head. I couldn't wait for the kids to be in bed so I could work on it. You just never know when inspiration will hit and what will trigger it. Just surrender—I'll need to remember that one. The flowers are a lot of fun to make! 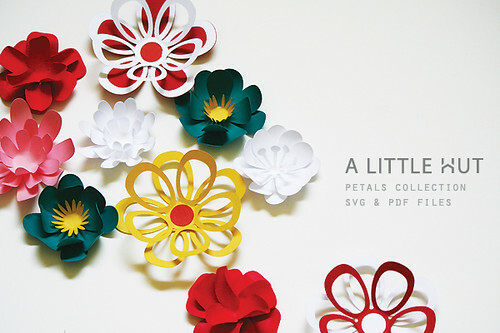 I didn't want to shoot for life like flowers—there are enough of those everywhere in the paper craft world. I wanted to just try my own thing. You know me... 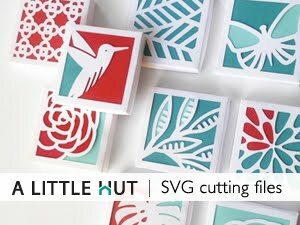 I'm all about solid colored paper, but these would also look great with patterns and maybe buttons in the center of each. The possibilities of customization are really endless! The PDF and SVG files are now available in the shop.